According to Merrill's "Encyclopedia of Law," ii. 192, bigamy consists in "going through the ceremony of marriage with another while a former husband or wife is still alive and not divorced." This definition finds no place in rabbinical law, according to which, in order to constitute bigamy, the second marriage must be a lawful union. Hence it follows that bigamy can be committed only by a man, since a woman who is neither divorced nor widowed can not enter at all into marriage with another, and any cohabitation is considered adultery. In Biblical as in Talmudical times polygamy was a recognized institution; hence there could be no question of bigamy. The singular opinion in the Talmud, that a wife can compel a divorce from her husband if he take a second wife, seems to have remained without following. So long as a man could support them, he was free to have as many wives as he chose, even against the wish of his first wife (Yeb. 65a, below; Maimonides, "Yad," Ishut, xiv. 3). The rabbinical prohibition against bigamy dates from the beginning of the eleventh century; Rabbi Gershon b. Judah of Metz forbade it under penalty of excommunication. His decree was accepted without opposition by the French and German Jews; though not in the Orient and in Spain and Portugal, where his authority was questioned. Polygamy is still actually to be found among the Jews in Oriental countries where it is permitted by the law of the land. 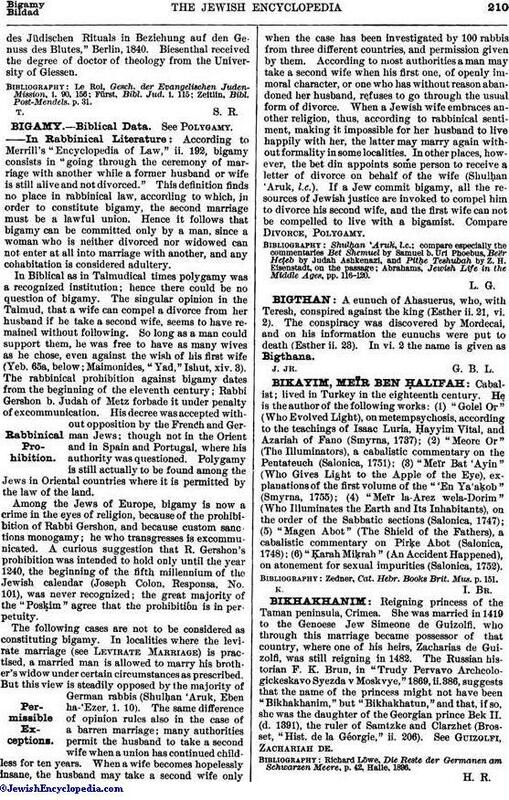 Among the Jews of Europe, bigamy is now a crime in the eyes of religion, because of the prohibibition of Rabbi Gershon, and because custom sanctions monogamy; he who transgresses is excommunicated. A curious suggestion that R. Gershon's prohibition was intended to hold only until the year 1240, the beginning of the fifth millennium of the Jewish calendar (Joseph Colon, Responsa, No. 101), was never recognized; the great majority of the "Posḳim" agree that the prohibition is in perpetuity. The following cases are not to be considered as constituting bigamy. In localities where the levirate marriage (see Levirate Marriage) is practised, a married man is allowed to marry his brother's widow under certain circumstances as prescribed. But this view is steadily opposed by the majority of German rabbis (Shulḥan 'Aruk, Eben ha-'Ezer, 1. 10). The same difference of opinion rules also in the case of a barren marriage; many authorities permit the husband to take a second wife when a union has continued childless for ten years. When a wife becomes hopelessly insane, the husband may take a second wife only when the case has been investigated by 100 rabbis from three different countries, and permission given by them. According to most authorities a man may take a second wife when his first one, of openly immoral character, or one who has without reason abandoned her husband, refuses to go through the usual form of divorce. When a Jewish wife embraces another religion, thus, according to rabbinical sentiment, making it impossible for her husband to live happily with her, the latter may marry again without formality in some localities. In other places, however, the bet din appoints some person to receive a letter of divorce on behalf of the wife (Shulḥan 'Aruk, l.c.). If a Jew commit bigamy, all the resources of Jewish justice are invoked to compel him to divorce his second wife, and the first wife can not be compelled to live with a bigamist. Compare Divorce, Polygamy. Abrahams, Jewish Life in the Middle Ages, pp. 116-120.